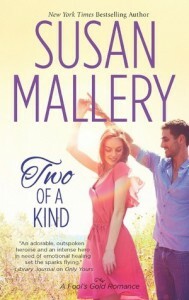 Review posted on Dark Faerie Tales.It’s not a surprise that I’m a fan of Susan Mallery’s. Most of her stories are easy to connect to. A strong woman, in her own right, meets a handsome man with his own strengths and weaknesses. Usually a romantic relationship develops, and there are hearts fluttering all around them. 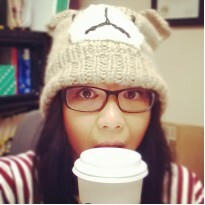 I have always gone to Mallery’s work when I needed an emotional pick-me-up. In the case of her latest story in the Fool’s Gold series, Two of a Kind, I fell in love with Gideon.Following the latest group to settle into Fool’s Gold, we follow Felicia. Once a military strategist, she has settled in the small town to connect with people on a more personal level. Her intelligence has always intimidated people, never allowing for a real connection. Eventually it became a shield to protect her from awkward social situations. But Felicia is determined to change all of that, hoping to have a normal lifestyle with a husband, a family, and a small house with a picket fence. Gideon is Felicia’s long-ago one-night fling. Also served in the military, they met overseas. Due to Felicia’s inexperience with many social situations, she propositioned him to do more than just talk. Gideon has since then moved to live a life of privacy, trying his best to escape his own past. But as small towns go, he meets soon encounters Felicia. I adored Felicia. As a reader, I always find ways to connect to one or more of the main characters. It was easy for me to connect to her vulnerabilities. Mallery wrote her as a real woman, with all the insecurities being with other women, other men, and social situations altogether. I loved how she wasn’t a damsel in distress. Felicia is smart and capable, and I really adored that she intimidated men. It took me a bit to warm up to Gideon. He was too protected for me to understand who he was. The slow build of his character, regardless if I’ve seen him in the previous books, put me off in some ways. I couldn’t connect to him, and maybe that was on purpose. He’s strong and he has so many good qualities about him, but it wasn’t love at first sight. This time around, Fool’s Gold wasn’t renewed or Mallery didn’t showcase a whole side of town I didn’t know. She stuck to the familiar and that was good enough for me. Sometimes, I can get caught up in wanting something new that I forget to just appreciate what is already there. Fool’s Gold is a story that is 12 stories long now, and I have not yet grown tired of it.I wasn’t in love with Two of a Kind as I am with the other stories. And it isn’t the fault of the story itself or Mallery for that matter. I have most likely read a similar story. And this happens to stories more often than not. Mallery wrote it with her characters in mind and this is probably where the progression of her characters were going.If you love Fool’s Gold and all of Mallery’s characters, you’ll love Two of a Kind.